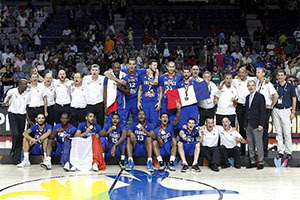 There will be some who say that France deserved a medal for knocking hosts Spain out of the 2014 FIBA World Cup and they achieved this accolade on Saturday. In the third and fourth match, less than 24 hours after France narrowly failed to book a place in the final, they battled their way past Lithuania in another excellent match. There were just two points in it at the end, which meant that there was something to play until the end of the game, which is exactly the sort of excitement that the tournament organisers wanted from their big games. France were the strongest team in the first half of the game, but perhaps due to tiredness or wanting to preserve their energy for a big finish, dropped down in the third quarter. With a minute to go, France looked on course to seal the win comfortably but a spirited fight back and then a 3 pointer from Adas Juskevicius brought Lithuania back to one point. With 16 seconds on the clock, there was all to play for, even if the teams went about it in a strange, albeit tactical, way. There were 11 fouls committed within the final 16 seconds, which meant that there were 22 free-throws taking place in this final period of the game. When you are watching the clock, seconds can sometimes feel like minutes, but in this case, it genuinely did take minutes to play out the final seconds of the game. With a second left on the clock, Jonas Maciulus was fouled and with his initial three throw attempt, he scored and made the score 95-93. He knew there was no point in scoring the next one, so he missed the shot on purpose with the hope that a team mate could grab control of the ball and fire in a shot that could take the game to Overtime. Unfortunately for Lithuania, it was a French player, Florent Pietrus, who grabbed control of the ball and sprinted towards the Lithuanian half, running out the clock and winning the game and third place for the French side. It was a thrilling end to a breath-taking game. When you take on board that France were trailing at the end of the third quarter, by a score of 71-64, the fact that they found the strength and energy to rally in the fourth quarter has to be celebrated. 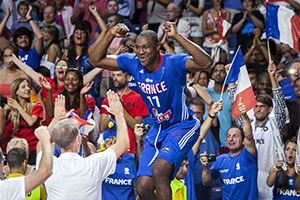 Boris Diaw was a main player in the final quarter, picking up 8 of the 31 points that France grabbed in this period of the game. In total, Diaw picked up 15 points but it was Nicolas Batum who was the top scorer for France in the game, with 27 points. Jonas Valanciunas was the top man for Lithuania with a total of 25 points and 9 rebounds, a great return, but not enough to propel his team into the medal positions at the FIBA World Cup. Joffrey Lauvergne also grabbed 9 rebounds, while picking up 13 points. It had been a hectic start to the weekend for France and while everyone else in the basketball world will be looking forward to Sunday’s final and seeing whether Team USA can fulfil their pre-tournament billing, the French team will likely be resting up after great exertions on Friday and Saturday. Mind you, the glory of picking up a bronze medal at the event will likely be the best medicine player that any of the players could receive, so you can expect to see some French players feeling lively. Given that USA and Spain were overwhelming favourites, there was a sense that third place was the best that all of the other teams were playing for. In the end, that didn’t quite pan out, largely thanks to France, so in some way, it is fitting that they at least grabbed a medal for their efforts at the FIBA World Cup. The home crowd may not have loved the fact that their bitter rivals enjoyed a notable triumph on their patch but everyone else involved with basketball will have taken great pleasure in what France achieved this summer.